13:20 The opening session is now closed. We will close our live updates here also. 13:15 The head of the Arab parliament, Sheikh Ahmad Al-Garwan, addresses delegates. He says that the Arab region faces a lot of problems with the situation in Yemen, Libya, Syria, Iraq, Somalia and Palestine. He said that he supports quick Arab intervention in all of these conflicts, and highlights his support for Yemen’s President Hadi, referring to him as the legitimate leader of Yemen. He also urged Arab countries to "take all the necessary measures to counter terrorism in the region." He concluded by strongly backing the planned joint Arab military force. 13:15 The leader of the Organisation of Islamic Cooperation Iyad Bin Amin Madani is addressing the summit now. He says that extremism is irrelevant to Islam, which is a religion of peace. He added that sectarian division across the Islamic world is disappointing, and said that the OIC has always challenged the rhetoric of religious extremism. He expressed his support for the Saudi-led operation in Yemen and for President Hadi as the legitimate leader. 13:05 Speaking about the Yemen crisis, the UN chief says that he has “repeatedly condemned the attempts by the Houthis and former president Saleh to undermine political agreements by military force. I take note that military action has been undertaken at the request of Yemen’s sovereign and legitimate leader, President Hadi,” said Ban Ki-moon. “Negotiations -- facilitated by my Special Envoy Jamal Benomar and endorsed by the Security Council -- remain the only chance to prevent a long, drawn-out conflict. It is my fervent hope that at this Arab League summit, leaders will lay down clear guidelines to peacefully resolve the crisis in Yemen,” he said. “Further to the west, it is crucial that we continue to encourage dialogue among the Libyan people. UN-facilitated talks between Libyan actors are continuing along multiple tracks, facilitated by my Special Representative Bernardino Leon. The preservation of Libya’s unity and territorial integrity is essential” said Ki-moon. “In Iraq, I encourage leaders to continue and deepen national reconciliation efforts. I appreciate the League’s support for the people and government of Iraq in their fight against Daesh. This support also benefits regional stability,” he said. 13:00 Speaking about regional issues, Ban Ki-moon says that Lebanon "continues to stand as an example of co-existence. I urge Lebanese political leaders to overcome their political differences and elect a president to fill the leadership vacuum, which has stretched for over a year." He also mentions Israel and Palestine. “Seven months after the end of yet another war with Israel, Gaza remains a tinderbox – and the situation is getting worse by the day,” he says. 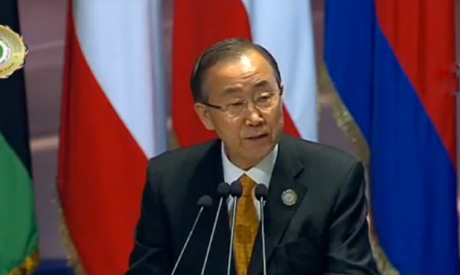 12:50 UN Secretary-General Ban Ki-moon, who is attending the summit, is addressing delegates now. The UN chief says that fighting extremism while committing abuses is wrong and counterproductive, and that wherever it has been tried, extremism has increased. He says that without good governance, respect for women's rights and for human rights, stability will be elusive. He also says he is "ashamed" about the situation in Syria, saying that he is angry at the collective failure to end the Syrian conflict. 12:50 Addressing delegates a few moments ago, Arab League Secretary-General Nabil El-Arabi mentions a number of crises facing the Arab world, namely in Yemen, Libya, Syria and Somalia, and says that Arab countries must take concrete steps and work on the joint Arab military force in order to combat terrorism and extremism. El Arabi also says that the Arab world is challenging terrorism, poverty and unemployment. 12:50 Following his speech, Saudi’s King Salman greeted Egypt's President El-Sisi and the Yemeni president and left mid-session. He is not expected to attend the closing session, an Ahram Online correspondent in Sharm El-Sheikh reported. 12:40 Hadi says that the military operation in Yemen aims only at defending the Yemeni people from an assault on their “Arab and Islamic identity” and on Yemen’s sovereignty. The Houthi rebels that have taken over the capital and large parts of the country are Shia Muslims. Hadi adds that the operation is in congruence with Article 51 of the UN charter, which gives nations the right to collective self-defence, and called for the continuation of the operation until the “complete surrender” of the Houthis. "We are keen on restructuring our military and police on national lines and in a scientific and modern way so that it is an army for the whole nation" Hadi declared. Hadi thanks all GCC countries and all countries supporting the coalition that led strikes in Yemen for their economic, political and military support of Yemen. 12:30 Yemeni president Abd Rabbu Mansour Hadi welcomes Arab efforts to defend Yemen. Hadi says that "dark forces" within Yemen and outside it have undermined popular legitimacy via a coup and militarised the Yemeni capital Sanaa and other provinces. He talked about fleeing from house arrest in the capital Sanaa earlier this week, and said that Yemenis are resisting the Houthi militias. He called for protests against the Houthis all over Yemen to show “the popular will" in support of constitutional legitimacy. 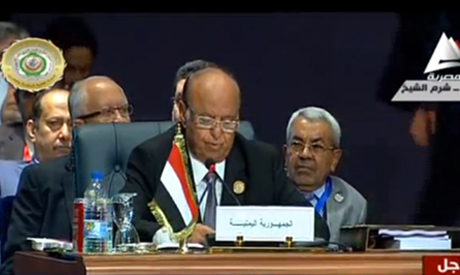 12:25 Yemeni president Abd Rabbu Mansour Hadi is now addressing the delegates. He thanks them for their sympathy with Yemen, and "for your support for legitimacy and stability of the Yemeni population." 12:20 The Saudi king also commented on other regional issues, saying that Palestinians must have an independent state, and calling for a peaceful resolution to the Syrian conflict. “We follow with anxiety the development of the situation in Libya,” said the king. He also called for a a region free from nuclear weapons. He also vowed that military intervention will not stop until Yemen is stable and safe. 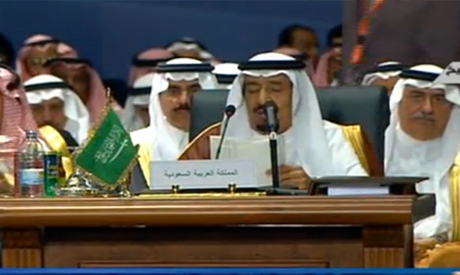 12:15 King Salman says the situation in the region necessitates an Arab coalition to fight terrorism. He says that he invited Yemeni president Abd Rabbu Mansour Hadi to his country for negotiations about the situation in Yemen, under the umbrella of the Arab League. He says that Saudi Arabia supports the Hadi government’s legitimacy in Yemen and wants stability for the Yemeni population. 12:10 And now the Saudi monarch, King Salman bin Abdel Aziz, is addressing delegates. 12:10 Sisi in his address to the delegates called military action in Yemen “inevitable” after the meddling in the country by a “'foreign power”, which he did not name. 12:00 In Yemen's capital Sanaa, the United Nations has began evacuating international staff due to the security situation in the Yemeni capital and the ongoing Saudi-led campaign against Houthi rebels, a UN source told Reuters. The source said the staff, numbering more than 100, were heading to the airport and were expected to relocate to several countries including Jordan. United Nations special envoy to Yemen Jamal Benomar was due to join UN Secretary-General Ban Ki-moon at the Arab summit in Sharm El-Sheikh, the source added. 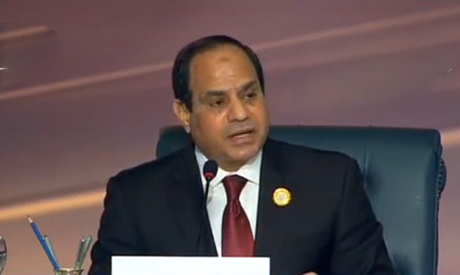 11:45 President El-Sisi is speaking now. He says that Arab countries are facing unprecedented threats to their stability and identity. He also says that Egypt has accepted a proposal by the Arab foreign ministers to form a joint Arab military force. On Palestine, El-Sisi added that "our hearts and minds are open for peace to all sides", a peace that mandates that Israel evacuates occupied Palestinian lands and halt its settlement activities. He added that the summit will tackle the issue of nuclear weapons, to establish a nuclear weapons-free Middle East. El-Sisi stressed that the future of the Arab nation depends on the decisions currently being taken by its leaders, amid rising challenges, in order that the future Arab countries won’t simply be left with pride in past glories but no ability to change their present. "Long live the Arab nation… long Live the Arab nation…long live the Arab nation," El-Sisi concluded. 11:35 In his remarks, the Kuwaiti emir said that after four years in which the Arab world experienced a stage of chaos and instability, which he says some have called the Arab Spring, Arab countries have suffered a sharp decline in development. He called for Arab unity in the face of these challenges. Al-Sabah announced that Kuwait will host a third donor's conference for Syria on 31 March, heeding the request of UN's Ban Ki-moon, and calling on fellow Arab countries for "generous participation". 11:35 A little bit before the opening session, President El-Sisi held a bilateral meeting with Qatar’s Emir Tamim bin Hamad Al-Thani to discuss bilateral relations and the latest developments in the region. 11:30 The delegations at the summit which are led by heads of states are Saudi King Salman bin Abdel-Aziz, Qatari Emir Tamim bin Hamad Al-Thani, Kuwaiti Emir Sheikh Sabah Al-Ahmed Al-Sabah, Bahraini King Hamad bin Isa Al-Khalifa, Jordanian King Abullah II, Yemeni President Abd Rabbo Mansour Hadi, Palestinian President Mahmoud Abbas, Iraqi President Fouad Masum, Tunisian President Caid Essebsi, Somali President Hassan Sheikh Mohamud, Sudanese President Omar Al-Bashir, Mauritanian President Mohamed Ould Abdel-Aziz and Djiboutian President Ismail Omar Guelleh. The Omani delegation is led by Asaad bin Tarek Al-Said, personal envoy of the Omani sultan, the Emirati delegation by Shaikh Hamad ben Mohamed Al-Sharqi, ruler of Fujairah Emirate in the United Arab Emirates, the Libyan delegation by the speaker of the House of Representatives Aqila Saleh, the Lebanese delegation by premier Tammam Salam, the Algerian delegation by the president of the nation’s council Abdel-Qader bin Saleh, the Comoros delegation by Vice-President Nour El-Din Borhani, and the Moroccan delegation by head of the Moroccan government Abdelilah Benkirane. 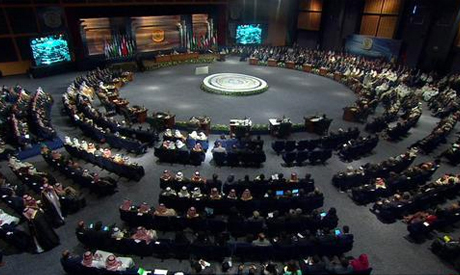 Syria’s seat is empty, as the Arab summit decided to suspend Syria in 2011. 11:20 The opening session is underway with remarks from Kuwait’s emir, Sheikh Sabah Al-Ahmad Al-Jaber Al-Sabah. Kuwait was the previous host of the Arab League summit. In his remarks the emir thanked Egypt for its hospitality. The agenda of the summit itself and the monitoring of the implementation of its decisions and commitments. The Palestinian cause, the Arab-Israeli conflict, Palestinian resistance and the activation of Arab peace initiative. Developing the Arab League and amending the Charter of the League. Developments in the crisis in Syria, Libya and Yemen. The Iranian occupation in 1971 of three Emirati islands, the Islands of Greater and Lesser Tunb and Abu Musa. Arab national security and combating terrorist extremist groups. A review of all draft resolutions submitted by the Economic and Social Councils. Issuing a declaration of the Sharm El-Sheikh summit. Deciding on a host for the next summit. Formal thanks to Egypt as host and discussion of any other developments. Yemen will also be discussed. You can find a timeline exploring political events in Yemen here. 11:10 Kuwait, the host of the last Arab League summit, is about to hand over the reigns to Egypt, to begin hosting the current summit. 11:00 They are now taking the official picture of the attendees. 10:50 Egypt’s President El-Sisi met with Saudi King Salman bin Abdel-Aziz and Yemeni president Abd Rabbu Mansour Hadi for “a tripartite summit” at Sharm El-Sheikh’s international airport, Egyptian television reported. 10:30 King Salman of Saudi Arabia, Jordan’s King Abdullah II, Qatar’s Emir Tamim bin Hamad Al-Thani all arrived on Saturday morning and were greeted by President El-Sisi, while Lebanese Prime Minister Tammam Salam was greeted by Egypt’s premier Ibrahim Mahlab. This year’s Arab League summit, taking place on Saturday and Sunday in the Red Sea town of Sharm El-Sheikh, will see a large contingent of Arab heads of state gather to discuss key issues of the moment. Top of the agenda is the crisis in Yemen, where a Saudi-led force on Thursday launched airstrikes on Houthi rebel fighters. Backing the campaign are the UAE, Qatar, Bahrain, Kuwait, Egypt, Jordan and Sudan. Yemeni President Abed Rabbo Mansour Hadi, who fled his country on Friday, will be present at the summit. Other issues expected to be discussed include Syria and Libya. In the last 50 years Arab League has done nothing except implementing US policy in the Arab world. In the history of Arab League no thing good comes out of the meetings that take place up to now. The current Yemen crisis is a classic example of frailer of the Arab League. The worst thing is now involving in Yemen with out the any mandate and planned agenda. The involvement of US blended in the name of Arab League will consume Saudi and its allays in the long term. I would like advice the Egypt government not to involve in such an mandated military action against the Yemen people. This crisis only can be solved through political dialogue and economical support. Military involvement will not solve the problem but will create another Iraq in the Arab world. The Arab League first should free itself from serving the interest of US and EU in the expenses of the great Arab people. Arab League should be restructured to serve the Arab People not the US or EU.